I made this recipe dozens of times and I feel like doing it over and over again. I tried different versions of it but finally I stayed to this one. It grows perfectly every time, both in the wood fired oven and in a conventional oven. I also used baking pans when I wanted a perfectly squared shape to use for example for sandwiches. Every time, this recipe didn't let me down. The most impressive part of this bread is the taste and its texture. When eating a bite feels like traveling back in time, a hundred years ago, to a dinner in the country side. I find this recipe also to be very flexible. I prefer the option to make the first fermentation overnight. When it is not very cold, I let the dough outside the house in a closed bowl. If there is freezing outside, I put the dough it in the pantry where I have a constant temperature of 10-11ºC in the cold winter days. I usually prepare the dough on Saturday evening, and on the next morning when I wake up, I check how much it has raised. Also the initial temperature of the ingredients plays a little role in how raised the dough is and not only the temperature during the night. After the final fermentation, I arrive to bake this bread as early as 12 PM the next day or even later at 5pm. It mainly depends on the room temperature where the dough is let to raise. This also gives you flexibility in your day schedule so you can fit the bread making into your life not the opposite. Day 1, 22:00. Mix all ingredients with a standing mixer for 10 to 15 minutes. Day 1, 22:15. Let the dough in the mixing bowl, cover it with a silicone lid or with a film to avoid drying the surface of the dough. This is the first fermentation phase that is done over night at a low temperature. This means that if there are between 2-12ºC outside the house, the dough can be placed very well outside. If it is warmer than this or under 0º , place the dough in the fridge where you should have more or less 4ºC. Day 2, 08:30. Bring the dough to the room temperature (~20-25ºC). Day 2, 10:00. Take the dough out of the bowl and split it in 3. Shape the 3 loaves and place them face down in floured bannetons. Let them at room temperature covered with a linen towel. Day 2, 14:00. (it can be +/- 2 hours depending on how much the dough is raised. It can grow up to 2 times the initial size of the loaves). Bake the breads on a hot stone in a conventional oven for 15 minute at 275ºC then reduce it to 220ºC and continue to bake for another 3 minutes. The oven and the hot stone requires 45 minutes to be properly heated at 275ºC before starting the bake. Use also steam in the first 15 minutes of the bake. This can be achieved by heating some rocks placed on a tray under the stone during the heating. Then, just pour 150ml of water over the stones after the loaves were put in the oven. 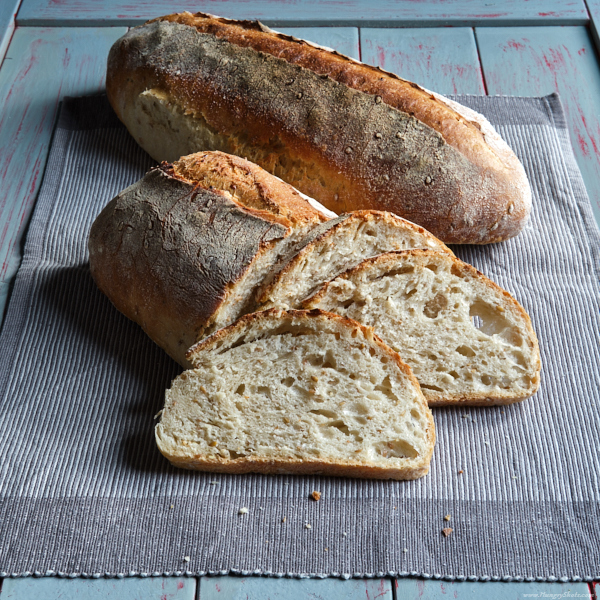 When baked in an wood fired oven, temperature cannot be adjusted easily, so when your oven temperature is about 300ºC insert the breads in the wood fired oven and let them bake no more than 25 minutes.